The Grimm Universe’s darkest hero is back in an all-new miniseries where Fight Club meets The Crow! Hellchild: The Unholy is the perfect jumping-on point for fans of the series as well as anyone curious to see what the evolving Grimm Universe has to offer. 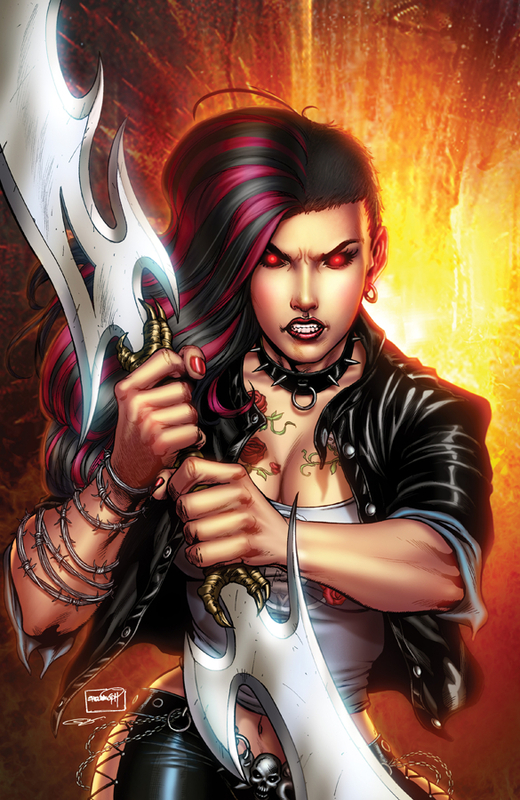 The seedy underbelly of New York is exposed in this first issue as Angelica Blackstone AKA Hellchild is pitted against demons and other unsavory creatures in an underground fighting ring in order to earn a living. Meanwhile, a seemingly good Samaritan deceives the homeless and chains them up in an abandoned building for his own rituals. When Angelica becomes a target and is no longer accepted in the underground fighting ring, a woman named Jezebel with some demons of her own saves Angelica’s life. With no source of income after the fighting ring incident, Hellchild could use a job. It just turns out Jezebel has a proposition for Angelica that could be the most sadistic mission she’s has had yet! Whether you’re into everything supernatural, a horror fan, or love action, there’s something for everyone in Hellchild: The Unholy!